The first known presence of the first white men in Sheboygan county is shown by a narrative now in the collection of historical data of the Wisconsin Historical Society, at Madison. The narrative states that Jacques Vieau, in the employ of the Northwest Fur Company, left Mackinaw on one of his regular expeditions in 1795, with a supply of merchandise to explore and establish trading posts on the west shore of Lake Michigan. The goods were contained in a large Mackinaw boat heavily loaded, and manned by twelve men. Vieau, with his family, consisting of his mother, Madeline, Paul and Jacques, followed in a large bark canoe, in which was also camp equipage. His clerk was Mike le Petteel. The first important camping place furnishing a good harbor was where Kewaunee is now situated. Here he established a "jack knife" trading post and left a man in charge. The flotilla paddled to various places on the lake and eventually landed at Sheboygan, where Vieau established a trading post. In 1818 Governor Lewis Cass, then the chief executive of Michigan territory, while on an exploring expedition, landed here with his fleet of canoes. In the same year, William Farnsworth, a hunter, trapper and fur trader, lived here on the banks of the lake a few months and afterwards became the pioneer of the county. History also has it, that in 1818, Andrew Vieau, son of Jacques, built a hut on the east side of the river and to him was born a child at about that time. From the records now at hand it is learned that William Paine and Colonel Oliver C. Crocker came to this locality in the fall of 1834 and built a sawmill at the first rapids in section 28. They then built two log houses, one in the city of Sheboygan, not far from the present location of the courthouse, and the other near the mill. The pioneers then began the construction of a dam across the river at a point later known as the "Ormsbee Mill" property. After this work had been well on its way a large band of Indians assembled before the workmen and protested against the improvement, the gist of their grievance being that the dam would prevent the fish from ascending the river, and some time was spent in negotiations before the consent of the Indians could be obtained to go on with the work. Not long after its completion the waters tore part of the dam away, but soon thereafter the obstruction was repaired. Paine and Crocker, however, soon became disgusted with their undertaking and the locality and in September, 1835, disposed of their holdings to William Farnsworth, the trapper and fur trader heretofore mentioned. In the following November the government survey of the county having been completed, the lands were placed on the market and for that purpose the government opened an office at Green Bay. It was then that William Farnsworth became owner of a half interest in the village plat of Sheboygan, part of which he sold at a most generous profit. After purchasing the mill Farnsworth went to Chicago and engaged Jonathan Follett and his wife to assist him in the embryo settlement. This worthy couple came to Sheboygan and Mr. Follett managed the mill, while Mrs. Follett supplied the comforts of life for the settlers, who took up their abode in the log house near the mill. Mrs. Eliza Follett was the first white woman to become a permanent resident of the county, and did not see another woman of her color until the following year, for at this time the only settlers in the county were those at the mill. It is said of William Farnsworth that his wife, Marinette, was an Indian squaw, and that her birth place was on the present site of the city of Marinette. She had spent part of her time among the Chippewas at Sheboygan and while here Farnsworth wooed and won her. It was probably about this time that Farnsworth committed some offense, which so angered the red skins that they gathered with the intention of killing him. Being aware of their intentions and feeling that only heroic measures should be adopted to save his life he sat down upon an open keg of powder with a lighted candle in his hand. The courage of the man and his unanticipated bravado so astounded the Indians that they conceived the idea he must be under the special protection of the "Great Spirit." Their anger was appeased and Farnsworth was never again molested by them. Strung along the lake, however, was an Indian village, the habitations of which were constructed of bark. Mr. Follett entered land not far from the mill and on the left bank of the Sheboygan river, near the mouth of a stream known as Follett's creek, he built the first log farm house in the county. During the fall of 1835 a number of persons visited this county, some of whom later settled here and took quite an active part in the development of the community, prominent among whom were Silas B. Stedman and David Giddings. Early in the summer of 1836 Charles D. Cole and family settled on the present site of the city of Sheboygan, and about the same time A. G. Dye arrived at Sheboygan from Chicago under an engagement with William Farnsworth to build a warehouse. William Ashby entered the village on foot from Green Bay in the fall of 1836 and engaged in lumbering. In December of that year the Gibbs brothers, James H., John D., and Benjamin L., settled in the present town of Lima. They were eight days cutting their way through the woods from Milwaukee, a distance of fifty miles. At the close of 1836 Sheboygan had become a village containing fifteen or twenty buildings, including two stores, two warehouses and a blacksmith shop, which was increased somewhat in 1837. At that time the spirit of speculation became rampant and the prices of land and village lots took on such fictitious values that made a collapse in the progress of affairs inevitable. At the close of the year 1837 the bubble burst and the young city was given a body blow. All business stopped. Those who could remove from the place did so and those who could not get out of the county settled on land previously purchased. It is said that at one time, in 1839, Mr. and Mrs. James Farnsworth were the only persons living in what is now the city of Sheboygan. In the early part of 1840 the only persons living in Sheboygan county, of which any record has been preserved, were James Farnsworth and family and John Johnson and family, the last mentioned locating near the present cemetery at Sheboygan. Near the sawmill built by Paine & Crocker lived Albin Rublee, Adonikan Farrow and William Ashby. At Sheboygan Falls, where a sawmill and three houses had been built, were Colonel Silas B. Stedman, C. D. Cole, David Giddings, a shoemaker named McNish, and a Mr. Palmer. William Trowbridge and son Benjamin had located two miles west of the Falls. In what is now the town of Lima were A. G. Dye, J. D., E. L. and James Gibbs, Dr. Hoffman and Benjamin Firrman. These settlers had planted their stakes for homes amidst the primeval forests, in which little clearing had been done at that time. Their nearest neighbors on the north were at Manitowoc Rapids. On the south, with the single exception in Washington county, there were no settlers nearer than within six miles of Milwaukee. The nearest inhabitants on the west were at Lake Winnebago. Supplies were mostly obtained in Milwaukee and brought in an Indian canoe. A little wheat was raised in 1840 but there was no mill to grind it. The blacksmith shop at Sheboygan, having been abandoned, that of Deacon Trowbridge's at Sheboygan Falls was the only one in the county. Nor was there a school or store in the county at that time. The financial crash of 1837, the direct heir of the publication of Jackson's famous specie circular, had done its workwell. By 1842 settlements in the county had increased very encouragingly. That year George C. Cole, a brother of Charles D. Cole, arrived. He found here Captain N. W. Brooks, wife and domestic; Stephen Wolverton with his wife, son and daughter ; Joshua Brown and wife ; John Glass and wife; Don Fairchild ; David Wilson and family; Alber Rublee and family; David Evans and wife; Hiram G. Squires; William Ashby and wife; Aaron Ritter and family; Aldonikan Farrow; and Wentworth Barber. These were located in Sheboygan and along the lake in the town of that name. 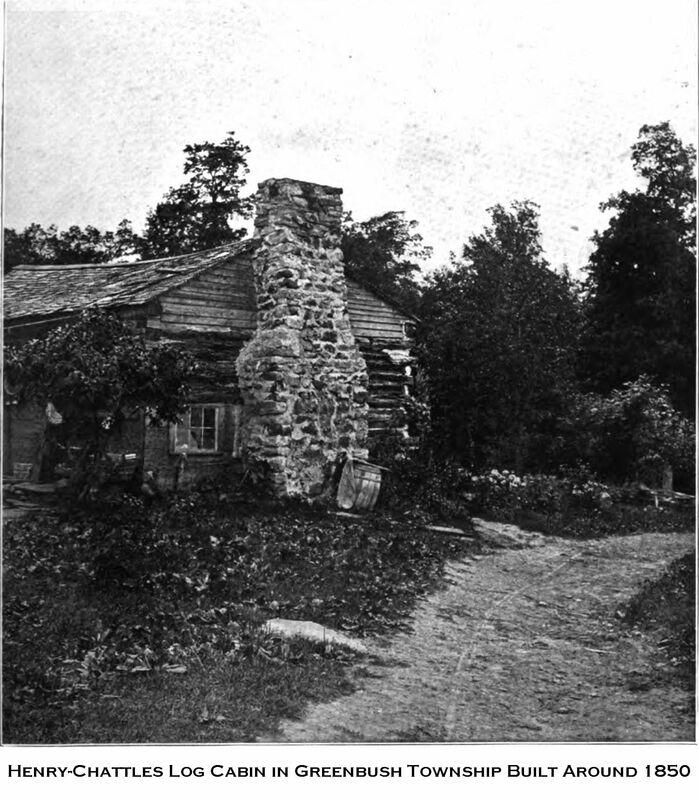 At the Dye settlement were Asahel G. Dye and family; the widow Farmin and son Benjamin; Newell Upham and wife; Chauncey Hall and family; Wendell Hoffman and wife; Elizabeth Cady and brother Edwin. The Gibbs brothers, with their families, were at Gibbsville, in Lima town; Mr. and Mrs. John Johnson and children, George, Michael, Robert, John, William, Ann and Maria; Peter Palmer and wife; William and Leroy Palmer, and Allen W. Knight and wife. At Sheboygan Falls there were Albert Rounseville, wife and two children; Benjamin C. Trowbridge, wife and family; Alvira O'Cain, Maria Dieckmann, Seth Morse, Samuel Rounseville, Harmon Pierce, Nelson Bradford, and George O. Trowbridge. The seven persons last named lived with Mr. Trowbridge at this time. There were also here Silas Stedman and wife; David Giddings and wife; Charles D. Cole, wife, and George T., William H. and James R. Cole, his sons. William Trowbridge, his wife and sons, William S., James T., Thaddeus and John. 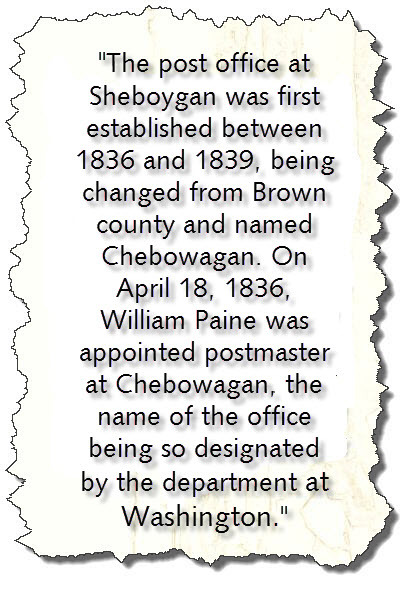 In 1840 the only post office in the county was at Sheboygan Falls. From an extract of the records at Washington it appears that William Paine was the first one to be appointed postmaster in the county. The office was then named by the authorities in Washington Chebowagan. Paine received his appointment April 18, 1836, giving way to his successor, Joel S. Fisk, July 21, 1836, who was succeeded by Charles D. Cole, November 25th of the same year. November 20, 1839, the office was discontinued, and not revived until October 25, 1844, when Samuel D. Ormsbee was appointed to the office by the Polk administration. Charles D. Cole was postmaster at Sheboygan Falls in 1840, having removed there from Sheboygan the previous year. This settlement was the principal one in the county at this period, had the largest number of inhabitants and was the most prosperous. From 1845 and on up to 1850 immigration into the county increased rapidly and many who took an active part in developing the county and its cities, building up its institutions and making for the community an enviable reputation throughout the state, settled here during those years and became prominent and influential citizens. Dr. J. J. Brown was one of the pioneers of this period. Others whom we are able to mention were Henry S. Auable, Evan Evans, Dr. S. M. Abbott, H. Conklin, E. F. Cook, A. H. Edwards, L. W. Davis, Judge William R. Gorsline, Thomas C. Homer, J. F. Kirkland, General H. C. Hobart, Rev. H. Lyman, A. P. Lyman, Dr. Jairus Rankin, John Maynard, William Seaman, H. N. Ross, H. N. Smith, Judge David Taylor, D. C. Vosburg, J. R. Sharpstein, John H. Roberts, George M. Gillett, Frank Stone. 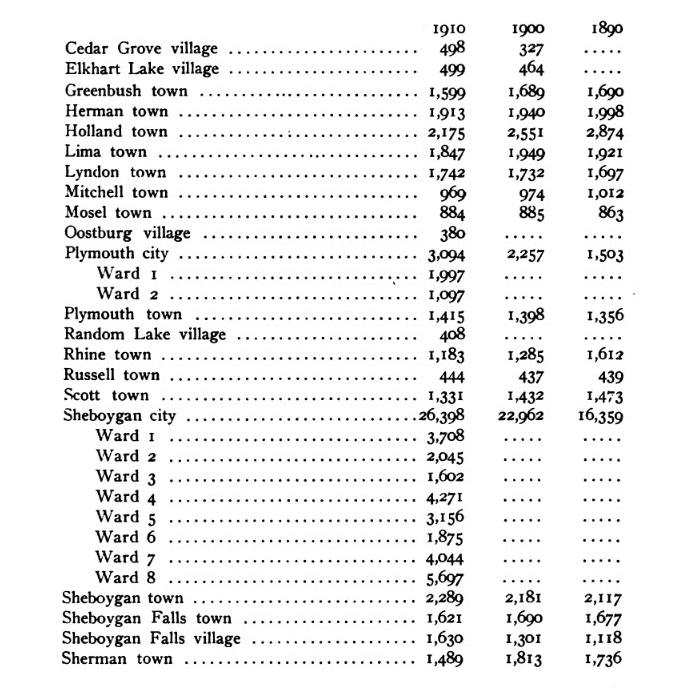 From the character of the names heretofore recorded on these pages, the reader will see at a glance that Sheboygan county was opened for settlement by native born American citizens. It was not until the latter part of 1846 that the sturdy and industrious Germans set their eyes upon this land of peace and plenty and began to settle here. However, a few Hollanders had gone into that section which later became the town of Holland, in 1845, but the great influx of the foreign element, principally Germans and Hollanders, arrived in 1847 and 1848, many of those coming in the latter year being refugees from Germany, leaving the fatherland to escape the rigors and penalties of a revolution that swept their native country that year. The truth of the saying, "its an ill wind that blows no one good," was exemplified much to the benefit of this country when this people were compelled to leave their homes and firesides across the water to seek a haven and new homes in the United States. A great share of the German immigrants came to Wisconsin and no better selection of that share could have been made than the ones who threw in their lot with those who rocked the cradle of the infant, Sheboygan. H. C. Heide, of Milwaukee, is given credit for starting German immigration to this section. 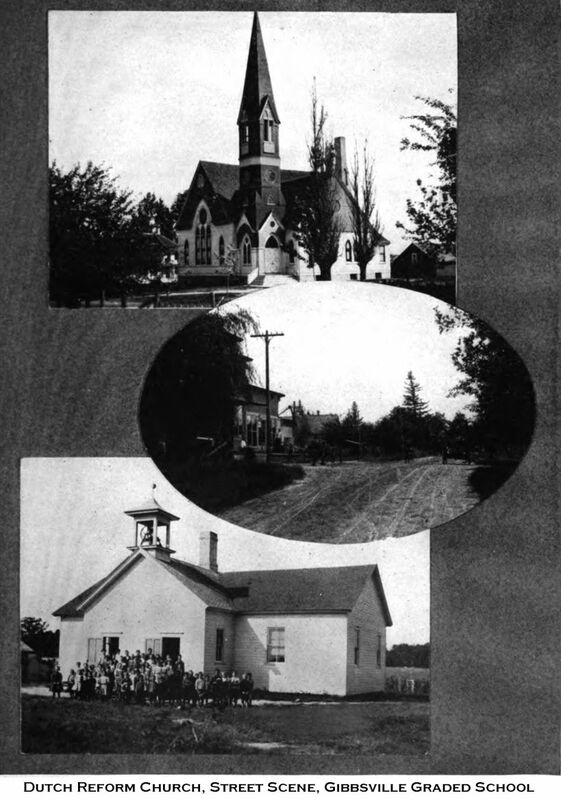 A brother of his with Diedrich Logeman, George Thieman and Diedrich Bartels, were the first comers to the county and settled in the town of Sheboygan Falls. They were soon followed by many others until their number so increased that they became the predominant nationality in Sheboygan county and remain so to this day. The state immigrant agent in one of his reports states that during the summer of 1853, 13,400 immigrants landed at Sheboygan. Many of them are mentioned in the various articles relating to the history of the towns.